In an update on the measles outbreak in Brooklyn’s Orthodox Jewish community, health officials have reported an additional five cases. Since October, there have been 29 confirmed cases of measles in the Orthodox Jewish community in Brooklyn. The initial child was unvaccinated and acquired measles on a visit to Israel, where a large outbreak of the disease is occurring. One additional measles case has been reported in Rockland County, NY, bringing the outbreak total to 76. These cases are presently clustered in eastern Ramapo (New Square, Spring Valley, Monsey). Measles is a highly contagious respiratory disease (in the lungs and breathing tubes) caused by a virus that is spread by direct contact with nasal or throat secretions of infected people (when a person infected with the measles virus breathes, coughs, or sneezes). Measles is one of the most contagious viruses on earth; one measles infected person can give the virus to 18 others. In fact, 90% of unvaccinated people exposed to the virus become infected. You can catch measles just by being in a room where a person with measles has been, up to 2 hours after that person is gone. And you can catch measles from an infected person even before they have a measles rash. Vaccination is the best way to prevent measles. 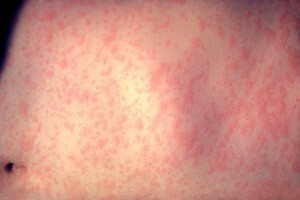 Anyone who has received two doses of a measles-containing vaccine is highly unlikely to get measles.